This is America – a country too diverse to be defined by a single music genre. At least that’s what a majority of Americans (72%) believe, according to a new survey conducted by YouGov Omnibus. That said, half of the country (50%) believes that America, as it is today, is best represented by rap and hip-hop. The survey spans twenty musical genres and the leading genres today may be rap and hip-hop, but nearly as many believe that country music (47%) reflects American values. Others also consider pop (42%), classic rock (38%), and R&B (32%) to be strong representatives of American culture. 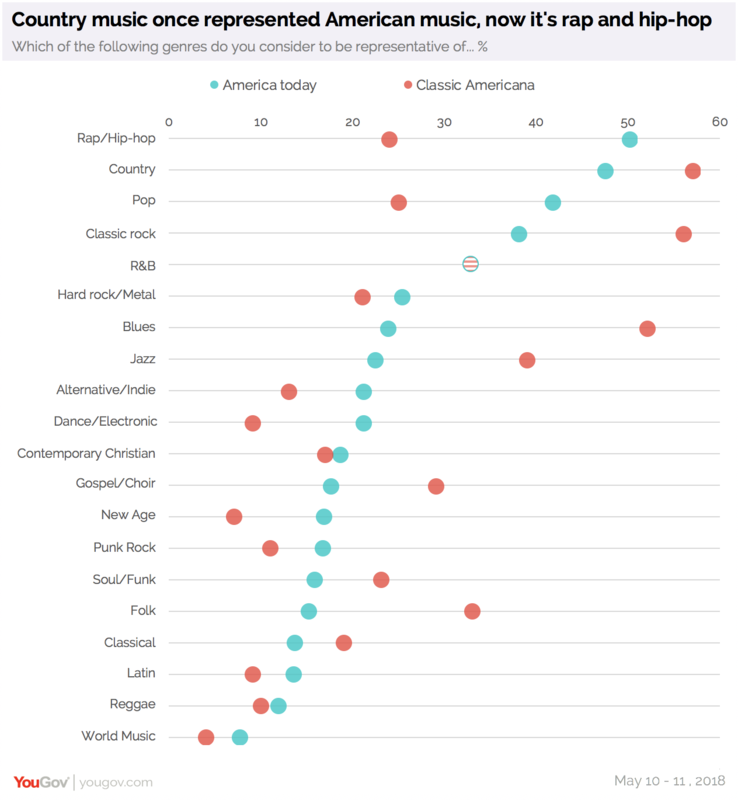 YouGov also asks which genres people thought represent “classic Americana”. Before giving way to rap and hip-hop, a majority say that country (57%) and classic rock (56%) once defined America. Other genres that people believe depict America’s past include the blues (52%), jazz (39%), and folk music (33%). 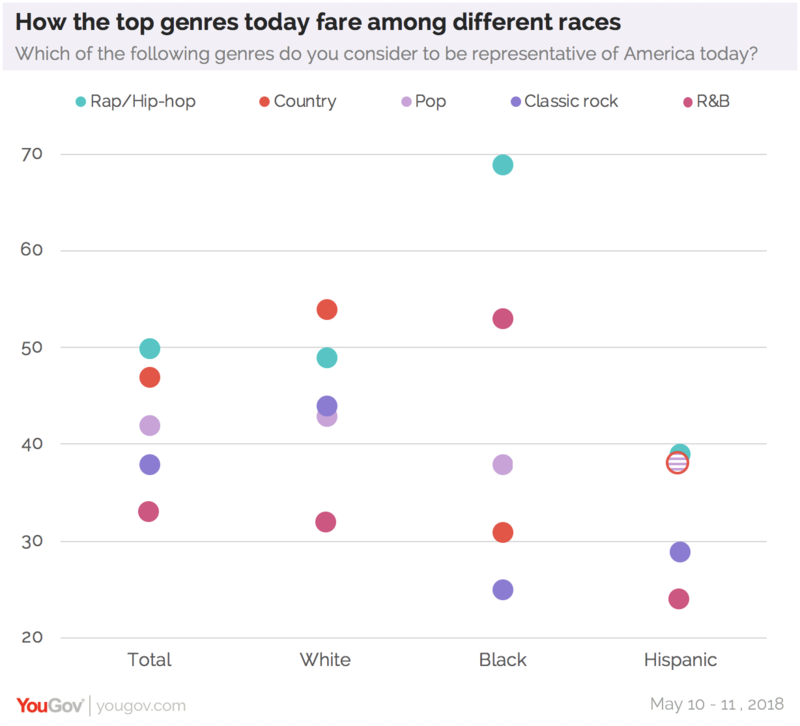 Race appears to play a factor in determining which genres people believe embody the core of America. 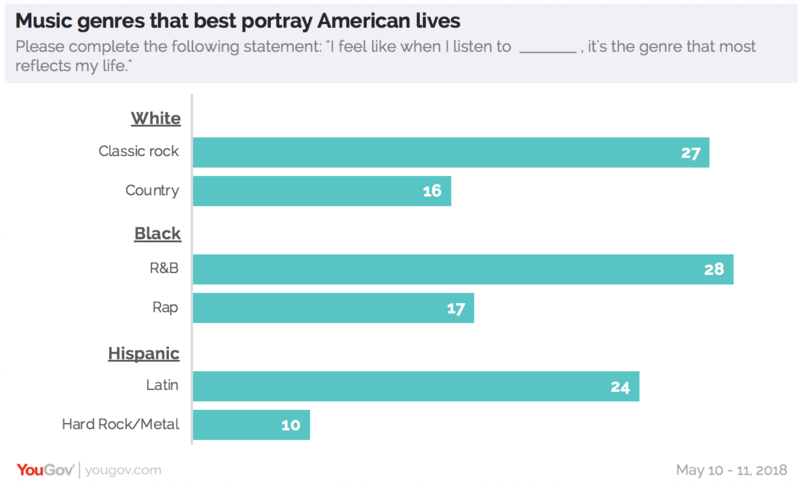 Whites are more likely to believe that country music (54%) defines America today, though nearly half believe that rap and hip-hop (49%) do too. Blacks are the most likely to hold that rap and hip-hop (69%) is representative of America today, followed by R&B (53%). When it comes to personal preference, one in five Americans say that classic rock (20%) most reflects their lives. Again, race influences the genre that people are most likely to choose. The leading response among whites is classic rock (27%), followed by country (16%). Blacks are most likely to say that R&B music (28%) is the genre that best reflects their lives, followed by rap and hip-hop (17%). Hispanics say Latin music (24%) best reflects their lives, though one in ten say that hard rock and metal (10%) do the same. One in two Americans (50%) believe that age is more influential than race or gender in determining the type of music people listen to. Millennials are more likely to believe that alternative and indie music (14%) best represents their lives, while those 35 and older say that classic rock best depicts their lives. In regards to the genre that has the most diverse artists, a quarter of Americans believe that rap and hip-hop (25%) own that top spot too. Nearly as many believe that all genres are equally diverse (24%). Americans’ taste in music will likely get more diverse, especially as more artists collaborate with one another across genres. The mixing of genres is something many Americans say they like; nearly one in two (48%) favor musicians sampling from other musical genres in their own songs.